Factual error: When Lovell's daughter is complaining that the Beatles have broken up, she slams the album Let It Be into her rack. 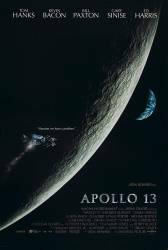 The scene takes place on the day of the initial explosion aboard Apollo 13, April 13 1970 - immediately prior to the Lovell family attending the screening of a television broadcast from the spacecraft. Let It Be was not released as an album until May 9th, 1970. Factual error: Technician John Aaron states that the damaged ship will need to use "less amps than this" as he points to a vintage 'Mr. Coffee' coffee-maker on his desk. Mr. Coffee was not introduced until 1972. Factual error: During the Engine 5 cutoff, they show the abort handle unarmed. However, it is required that the abort handle be armed throughout the entire launch. Factual error: Moments before and during the lift-off of the Saturn V, Ken Mattingly is shown to be watching from a somewhat private grassy field. Wherever he is supposed to be, he is far too close to the launch pad. No unauthorized persons were allowed to be that close, and certainly not in an undisclosed and unsupervised area, not the least of which was for security reasons. The fact that Mattingly is an astronaut would not give him carte blanch to do this, and his training and discipline would prevent his ever attempting doing so in the first place. In reality, Mattingly was in Houston at Mission Control at the time. Otherwise it is a nice shot. Factual error: When the cabin temperature drops, an astronaut's breath is visible. His visible breath rises as he exhales. This is an effect of gravity - on earth the water vapor in breath, which is the component that becomes visible in the cold, rises because it is lighter than the surrounding air. Since the astronaut was in a "weightless" environment, his breath should have travelled in a straight path from his mouth into the surrounding atmosphere, rather than rising. Factual error: When the LM separates from the CM just prior to re-entry, what you see in the film is an undocking, rather than a jettison. The difference is that in a jettison the CM's docking probe is pulled out of the CM to make way for parachute deployment, while in an undocking the probe (the triangular shaped thing pointing "forward" of the CM) is left to allow for redocking later. And in case you're wondering how the astronauts transferred between the two while docked with the probe in place, the answer is that they didn't - they dismantled it to create the tunnel. As an interesting aside, in real life the CAPCOM (I think it was Joe Kerwin) gave a go for "undocking" then corrected himself moments later using the phrase "correction, go for jettison"). Factual error: During the launch sequence, all nine swingarms on the launch tower are seen retracting, one by one, as the Saturn V reaches full thrust. In real life, only five swingarms would still be attached to the rocket during this phase. These "in-flight" arms would swing away as the rocket lifted off and cleared the launcher. Factual error: The fiery rocket plume left behind the Saturn V as it is ascending directly after lift off is far too small and short. In reality the flaming rocket plume was easily 2 to 3 times the diameter of the entire ship and at least 3 to 4 times the length. Deliberate mistake: Near the end of the movie, there is a shot of the "Iwo Jima" with the two recovery helicopters taking off. For a moment, you can see the number 11 on the inboard side of the ship's island, which identifies it as the USS New Orleans (LPH-11), a sister of the Iwo Jima. Admittedly, it was the best the producers could do, since by the time the movie was made, the Iwo Jima (LPH-2) had been decommissioned. Continuity mistake: When they are in orbit and Fred vomits you see Jim taking off his suit and an open hatch to the LEM which has not been docked yet. Later when preparing to jettison the LEM you see Jim closing the hatch over this tunnel. Factual error: The initial smoke shown coming out of the rocket gimbals during 'ignition sequence start' is not nearly fast or 'enthusiastic' enough. Additionally, there was in fact only a very tiny amount of white smoke/vapor emitted, and it almost instantly developed into a fiery, violent semi-transparent rocket plume. There is just way too much white vapor for too long a period shown in the film. Factual error: The NASA "worm" logo shown in the film was not created until 1975. 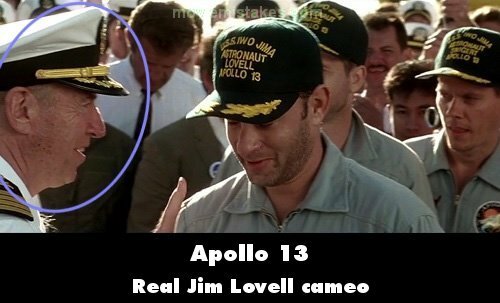 Factual error: The paint scheme shown on the Apollo 13 rocket is incorrect: The paint scheme shown in the movie is what was used on the development versions of the Saturn 1-C first stage, and featured a large black band around the middle. Technicians found it much too hot to work inside the pre-launch first stage from the heat generated from this paint scheme. Subsequently, the paint scheme was much simplified to a near all-white version for the first stage beginning with Apollo 4. All subsequent ship-stacks (including Apollo 13) featured this newer paint scheme. Factual error: When the astronauts pose for their photo shoot, the flag behind them has only 48 stars (a bit hard to tell, since it's rolled up, but the stars are arranged in straight rows parallel to the stripes, which was the arrangement used on the 48-star flag). It's 1970, so it should be a 50-star flag. Factual error: On several occasions the astronauts address the Capcom as "Andy." None of the Apollo 13 Capcoms were named Andy. Their names were Jack Lousma, Joe Kerwin, John Young and Vance Brand.